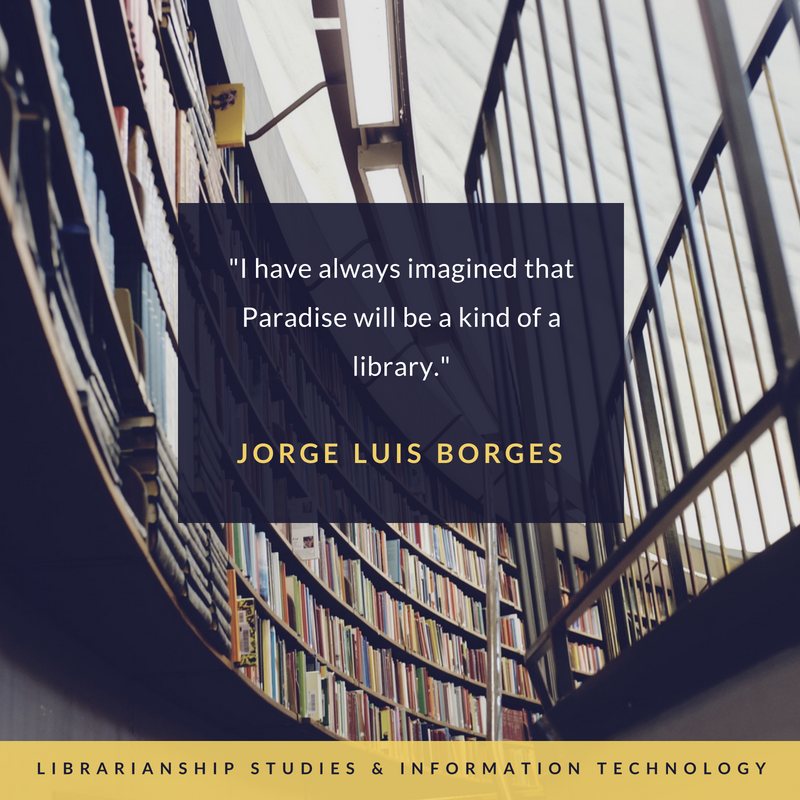 Top 43 Most Beautiful Quotations About Libraries, Librarians, Cataloging, Classification, Catalogers, and Library and Information Science. 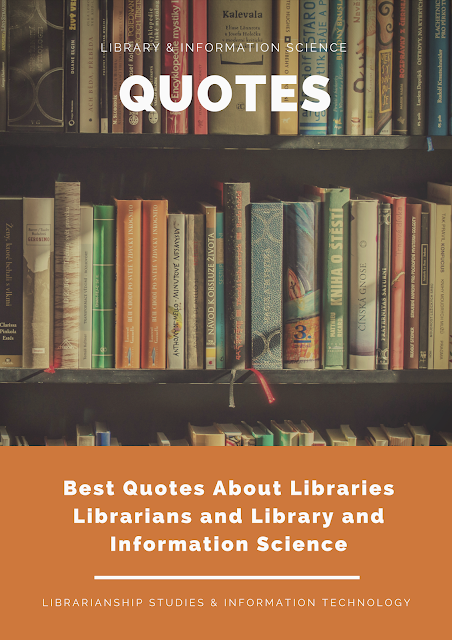 Famous quotes describing why libraries and cataloging important and librarians and catalogers indispensable. Includes inspirational and motivational quotes from famous personalities for personality development, personal development, self-improvement, and achieving greater success in personal and professional life. Below some of these quotes, is included a section "My Take" which is my perspective, opinion, or idea(s) about that quote when its implications are seen with reference to the development of Library and Information Science, Librarianship Studies & Information Technology. 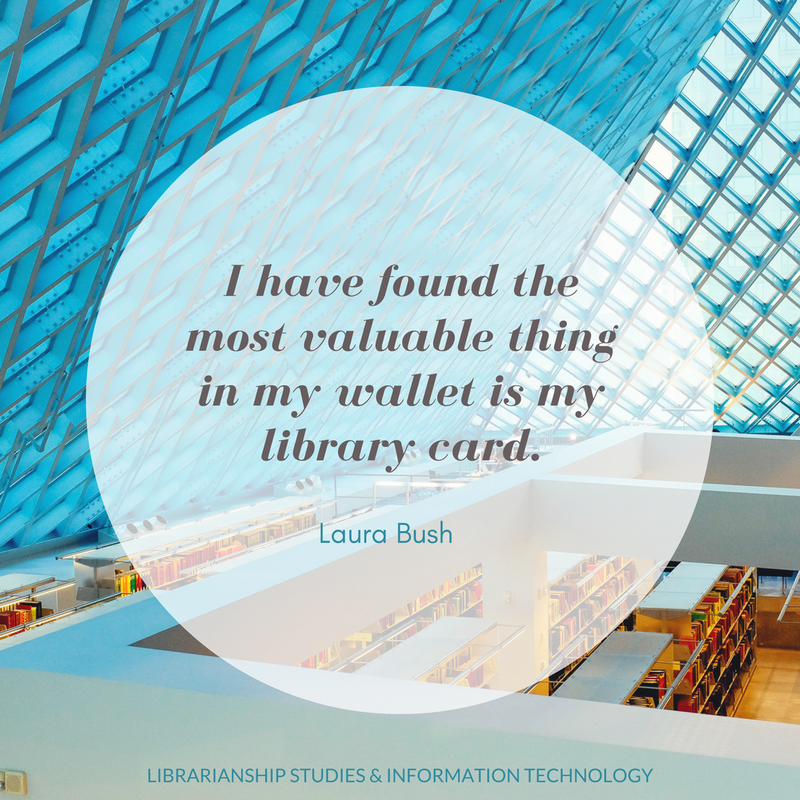 Laura Bush in her famous quote said: “I have found the most valuable thing in my wallet is my library card.” Visit your library, get your library card, and you’ll be able to borrow a print or electronic book, use free internet, or attend a course that will improve your digital skills. Libraries are essential in a process of giving citizens access to knowledge. In digital times they are needed more than ever before. In times of the internet, everyone can visit a library without leaving home. It’s just a matter of opening a library website, and you can not only borrow an ebook but also ask the librarian an online question. Most importantly, however, libraries are the places where you can expect smart and clear answers to even the most difficult questions. 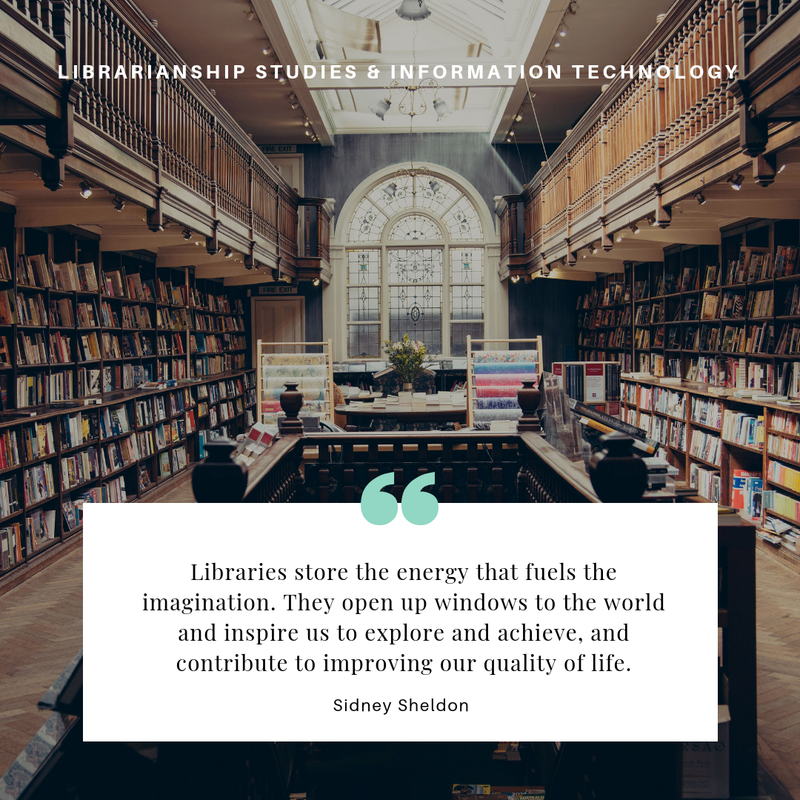 Now that we have discussed the importance of libraries, it’s time to through some light on the importance of the role of librarians. Jarrett J. Krosoczka says “It is an awfully sad misconception that librarians simply check books in and out ...” A librarian is a person who is in charge of or works professionally in a library and is responsible for its management and services. The librarian takes care of the library and its resources. Typical job of a librarian includes managing collection development and acquisitions, cataloging, collections management, circulation, and providing a range of services, such as reference, information, instruction, and training services, etc. The increasing role of technology in libraries has a significant impact on the changing roles of librarians. A 21st-century librarian is required to be very much updated with technological changes. New age librarians are making greater use of emerging technologies in the library management and services to make it more popular and useful among the patrons. According to Neil Gaiman “Google can bring you back 100,000 answers, a librarian can bring you back the right one.” New age librarians are not mere bookworms, they are high-tech information professionals, and clever communicators, helping patrons dive in the oceans of information available in books and digital records. Librarians are teachers, problem solvers, innovators, collaborators, leaders, and learners. 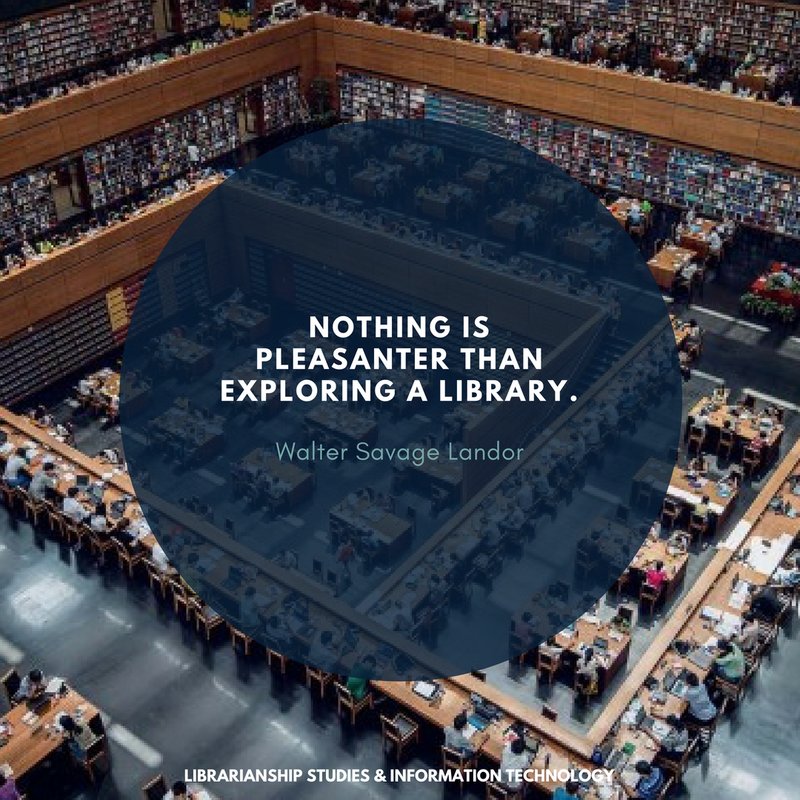 So now let us enjoy and appreciate these famous quotes describing why libraries and cataloging important and librarians and catalogers indispensable (in no qualitative order). 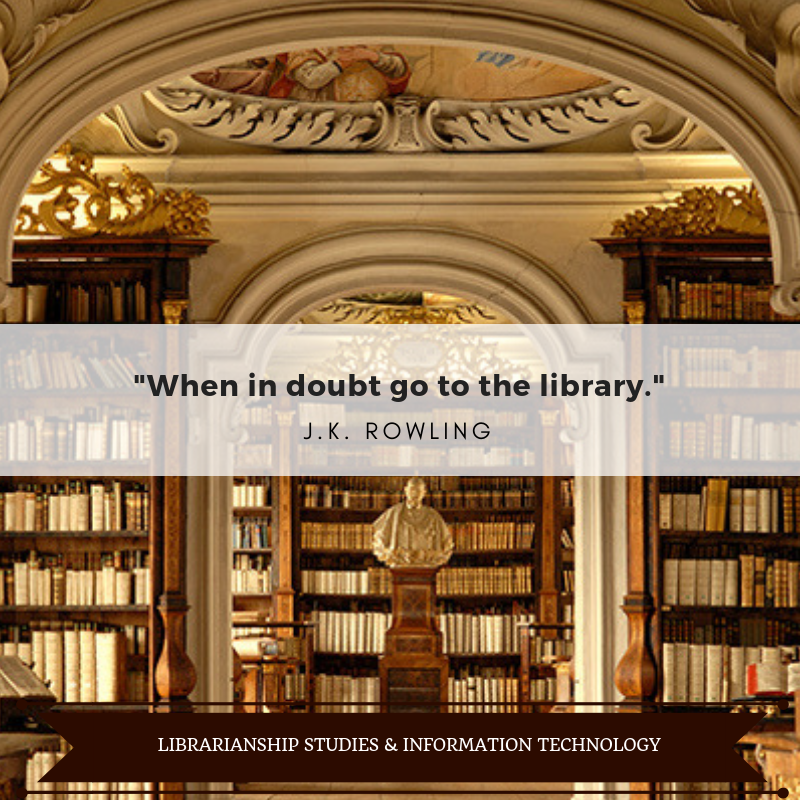 Best quotes about libraries and their importance. "Nothing is pleasanter than exploring a library." "Libraries store the energy that fuels the imagination. They open up windows to the world and inspire us to explore and achieve, and contribute to improving our quality of life." "When in doubt go to the library." 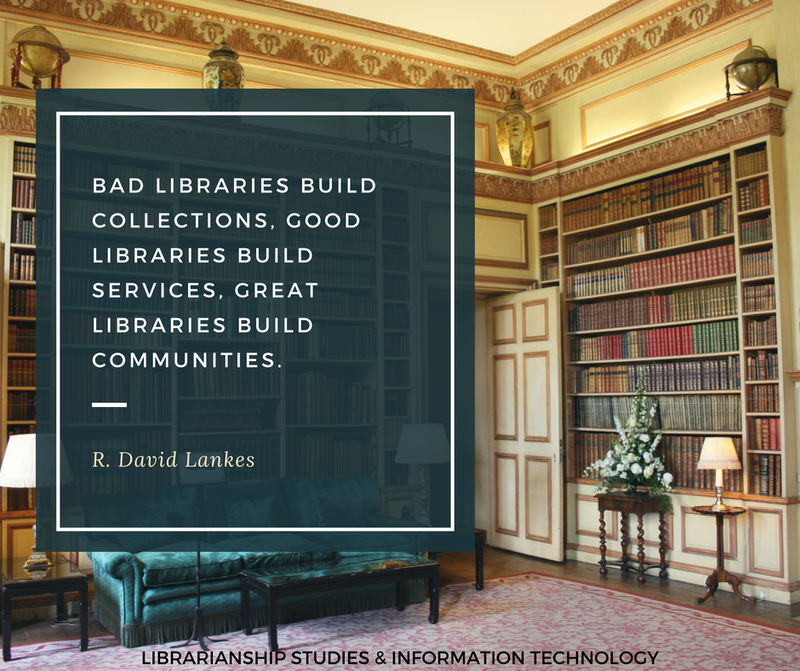 "Bad libraries build collections, good libraries build services, great libraries build communities." "I have found the most valuable thing in my wallet is my library card." "Libraries were full of ideas – perhaps the most dangerous and powerful of all weapons." "Libraries always remind me that there are good things in this world." "Everything you need for better future and success has already been written. And guess what? All you have to do is go to the library." "You want weapons? We’re in a library. Books are the best weapon in the world. This room’s the greatest arsenal we could have. Arm yourself!" Russell T. Davies (b. 1963. Welsh screenwriter and television producer) in science fiction series Doctor Who. "Cutting libraries during a recession is like cutting hospitals during a plague." "To ask why we need libraries at all, when there is so much information available elsewhere, is about as sensible as asking if roadmaps are necessary now that there are so very many roads." Walter Cronkite (1916-2009. American broadcast journalist) in American Library Association "Libraries Change Lives" Campaign, 1995. 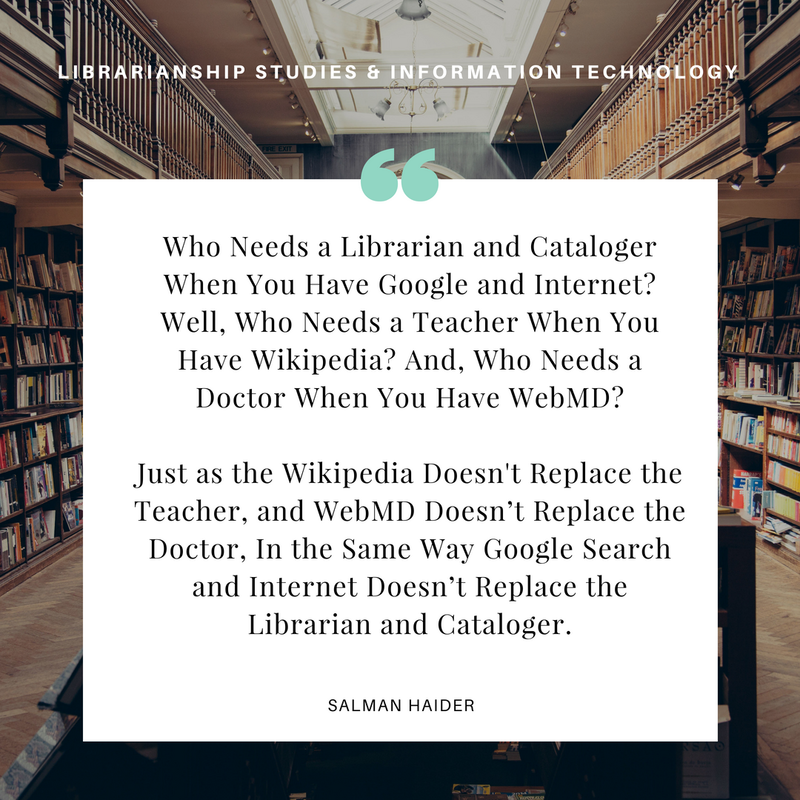 Best quotes about librarians, catalogers, and library and information professionals on what they do and why they are indispensable for the society. "The most important asset of any library goes home at night – the library staff." "In the nonstop tsunami of global information, librarians provide us with floaties and teach us to swim." Linton Weeks (Washington Post Staff Writer) in Washington Post, January 13, 2001. "Librarians are almost always very helpful and often almost absurdly knowledgeable. Their skills are probably very underestimated and largely underemployed." Charles Medawar (a specialist on medical policy and drug safety, director of a small London-based unit, Social Audit Ltd) in The Social Audit Consumer Handbook: A Guide To The Social Responsibilities Of Business To The Consumer. "Librarians are tour-guides for all of knowledge." "Librarians have always been among the most thoughtful and helpful people. They are teachers without a classroom. No libraries, no progress." "It is an awfully sad misconception that librarians simply check books in and out. The library is the heart of a school, and without a librarian, it is but an empty shell." 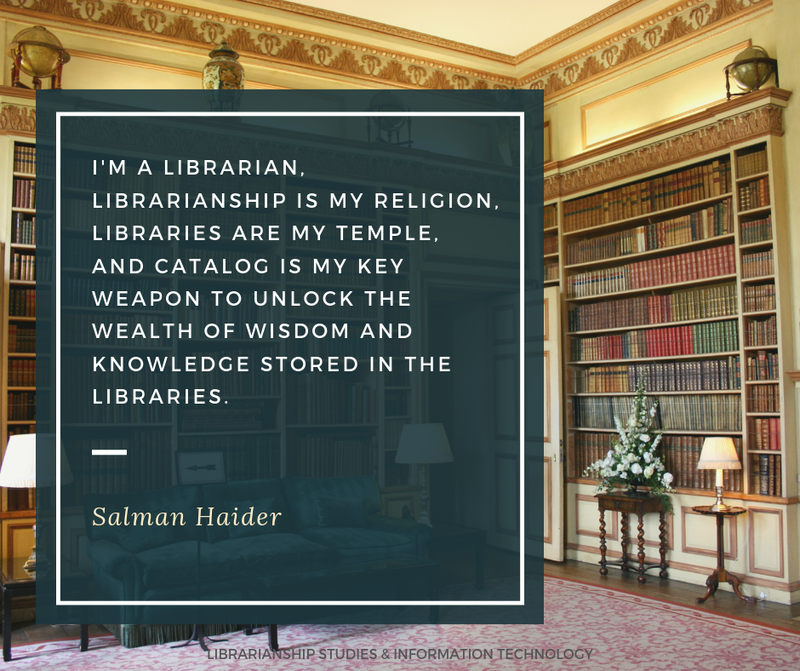 "I'm a Librarian, Librarianship is my religion, Libraries are my temple, and Catalog is my key weapon to unlock the wealth of wisdom and knowledge stored in the libraries." Best quotes about Cataloging, Classification and other important topics in Library and Information Science. "RDA offers libraries the potential to change significantly how bibliographic data is created and used. RDA is a standard for resource description and access designed for the digital world." OCLC, Librarianship Studies & Information Technology. "Classification, broadly defined, is the act of organizing the universe of knowledge into some systematic order. It has been considered the most fundamental activity of the human mind." Lois Mai Chan (1934-2014. American librarian, author, and professor at the University of Kentucky School of Library and Information Science, winner of Margaret Mann Citation for her contributions to the library science profession) in the book Cataloguing and Classification: An Introduction. "Cataloging is an old-fashioned term for resource access and discovery services. With resources increasingly available and accessed electronically, description and access points are vital to discovery and use by students and faculty." "Quality cataloging takes time and money. Without a good catalog, there is no library." "Cutting cataloguing budgets and support year after year and retirement after retirement is hurting the library in the long run and burning out the staff that remains. We need time and resources to learn the new models and standards at the same time we do our day to day work. This is work that now takes a bit longer to do - but in the long run we are making better records. The new linked data models have the potential for revolutionizing the services and information libraries can provide for their users and keep libraries relevant in an increasingly web-based information environment." "Quality authority work and attention to authority work by everyone working in the database is ESSENTIAL to the future of library linked data." B. Iseminger (Senior Music Catalog Librarian. Harvard University, Music Library, United States) in the book Survey of Emerging Cataloging Practices: Use of RDA by Academic Libraries. "If you want a future of libraries, it is within you, the librarians. If you want a healthy community that seeks out knowledge, and seeks informed conversation, then advocate for it beyond your walls." "There is fantastic information in books. Often when I do a search, what is in a book is miles ahead of what I find on a Web site." Sergey Brin (Sergey Mikhaylovich Brin (born August 21, 1973) is a Russian-American computer scientist and internet entrepreneur. Together with Larry Page, he co-founded Google. "Cataloguing is more than merely ‘processing’ an item. Metadata gives voice to collected works, brings their form and meaning to the surface of discovery, so that collections might be found and enjoyed." Alissa M. (Librarian, Cataloger) on Twitter. Best inspirational and motivational quotes for personality development, personal development, and self-improvement of librarians and information professionals. These are my personal favorite quotes which have made a great impact on me and my personality as a librarian. Initially, I intended to make this article as a collection of quotes on libraries, librarians, and library and information science only, but it was when I was reading the book Hit Refresh by Satya Nadella, that I decided to collect these quotes and present to the library and information professionals to empower and enable them to become better persons and professionals. Below some quotes, I have included a section "My Take" which is my perspective, opinion, or idea(s) about that quote when it is seen with reference to the development of Library and Information Science, Librarianship Studies & Information Technology. "Every person, organization, and even society reaches a point at which they owe it to themselves to hit refresh--to reenergize, renew, reframe, and rethink their purpose. If only it were as easy as punching that little refresh button on your browser. Sure, in this age of continuous updates and always-on technologies, hitting refresh may sound quaint, but still when it's done right, when people and culture re-create and refresh, a renaissance can be the result." Satya Nadella (Chief Executive Officer of Microsoft) in his book Hit Refresh. "A leader must see the external opportunities and the internal capability and culture--and all of the connections among them--and respond to them before they become obvious parts of the conventional wisdom." "I've often said that the best lines of computer code are like poetry. The writer struggles to compress so much thought and feeling into the fewest lines possible while still communicating the fullness of expression." Steve Jobs (Co-founder of Apple Inc.) in his commencement address at Stanford University in 2005. "Life is a 100-meter dash. Time is the race. Timing is of the essence. And success belongs to those who can squeeze the life out of every moment, instant, microsecond." Haider, Salman. Survey of Emerging Cataloging Practices: Use of RDA by Academic Libraries. Primary Research Group, New York, 2016. Nadella, Satya. Hit Refresh: The Quest to Rediscover Microsoft’s Soul and Imagine a Better Future for Everyone. Harper Business, New York, 2017. Help us improve this article! Contact us with your feedback. We would be happy to include important and interesting comments in this article. You can use the comments section below, or reach us on social media.